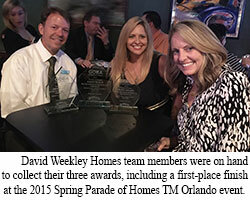 Orlando, FL (May 12, 2015): David Weekley Homes added to its lengthy awards count with another three awards during the 2015 Spring Parade of Homes™ Orlando. The nation’s largest privately-held home builder was honored with one first place award and two merit awards during the annual celebration. The Parade of Homes awards are chosen through the Greater Orlando Builders Association, which seeks to showcase the area’s best homes during the annual event. These three awards put Weekley Homes at more than 660 awards received for product design alone. Taking home the first place award for a single-family home within the $751,000 to $1 million price range, The Reef in Laureate Park at Lake Nona is 2,800 square feet with four bedrooms, three full baths, one half bath and a three-car garage. A retreat, bedroom, kitchen, living room and full bath located upstairs from the garage offer an additional 600 square feet. The Reef showcases Weekley’s Village Series of homes available in Laureate Park at Lake Nona. The two merit awards given were to The Dinsdale in Spring Lake at Celebration – Townhomes for multi-family homes over $300,000, and the Alameda in Spring Lake at Celebration – Bungalows for single-family homes between $451,000 and $525,000. At 1,700 square feet, the Dinsdale offers two bedrooms, two full baths, one half bath and a two-car garage. The Alameda features three bedrooms, two full baths, one half bath and a two-car garage.